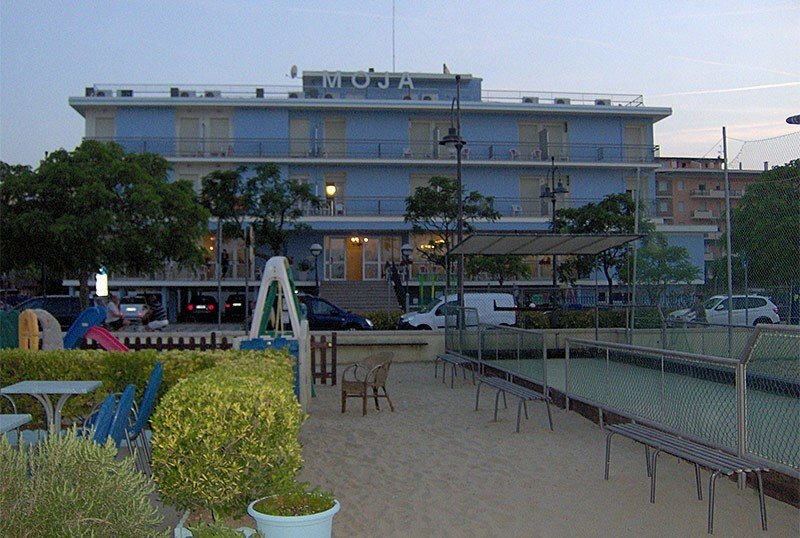 Hotel Moja , 3 star hotel on the seafront of Valverde facing the beach, offers a quiet and perfect stay for families thanks to the many services available to guests: hydromassage pool, ample parking, WI-FI internet access, air conditioning and free use of bicycles. No pets allowed. The hotel is located on the seafront of Valverde di Cesenatico: just across the road to reach the beach. The property is located not far from the Gatteo Mare railway station and close to the park of Levante, a green area with paths, playgrounds and a small lake. All rooms have a private terrace, digital terrestrial TV, safe, telephone, bathroom with hairdryer and air conditioning. Many rooms have a picturesque sea view. Garden with Jacuzzi, terrace overlooking the sea, open-air porch, reading room and TV room, elevator, bike rental with the payment of a deposit. PARKING: free, outside the building and fenced. WI-FI: connection present in the common areas. SERVICES FOR PEOPLE WITH DISABILITIES: ground floor entrance, standard elevator, room with wheelchair maneuver, wheelchair access shower, shower chair. BREAKFAST: a sweet and savory buffet with pastries, cakes, yoghurt, cheeses, cold cuts, cereals and much more. LUNCH AND DINNER: the kitchen prepares meat and fish menus with three first and three second courses, buffet appetizers and side dishes. Water, wine and orange juice at meals. OTHER: it is possible to request a packed lunch. - from 01.07 to 31.08 50% discount for children up to 16 years old. - You will be required to balance your stay within 2 days of arrival.